My son Michael is wearing the costume. The idea came from him he is obsessed with the Titanic. 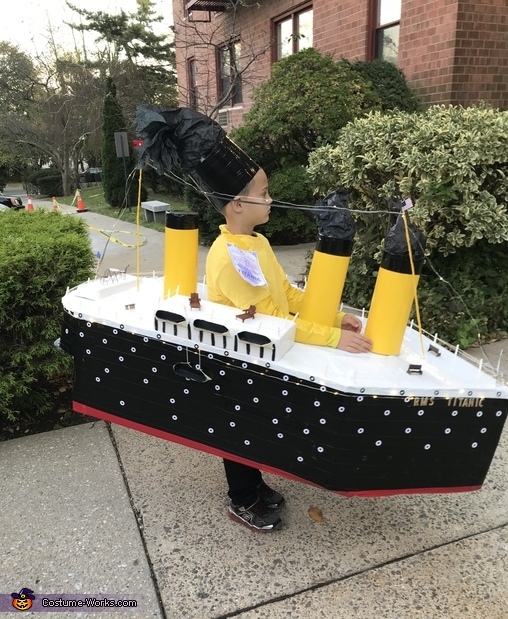 The costume is made from boxes and different colored duct tape. The railings are made from cut up straws and kitchen twine. The windows are loose leaf binder stickers. The steam stacks are rolled oak tag with yellow and black duct tag and black tissue paper as the smoke. Styrofoam is used to make the propella. Skewers make the flag polls and fairy lights were strung around the ship to light it up. Life boats were made from paper, masken tape and twine. Doll house furniture was used around the ship as deck furniture.